Bankura is an administrative unit in the Indian state of West Bengal. It is part of Medinipur—one of the state’s five administrative divisions. The Damodar River flows in the northern part of the Bankura district and separates it from the major part of the Burdwan district. The district has been described as the “connecting link between the plains of Bengal on the east and the Chota Nagpur plateau on the west.” West Bengal Bankura has been selected for this water distribution improvement project by the Public Health and Environmental Engineering Department (PHED) of West Bengal. PHED is headquartered at Kolkata for Multi-Village Bulk Water Supply Projects and is jointly funded by PHED and the Asian Development Bank. This project was limited to four of the eight blocks in the Bankura District: Mejhia, Gangajalghati, Indpur, and Taldangra, and is of critical importance to the region, as less than 4 percent of the 359,172 habitants in the 600 villages contained within the four blocks have a piped drinking water supply. The aim of this project is to connect the remaining 96 percent of the population through developing new water systems to meet supply, while rehabilitating the existing, aged water system to continue supplying existing customers. The scope of the project calls for adding 4,000 kilometers of new pipeline to the existing 100 kilometers of pipeline, leveraging a single hydraulic model covering more than 50 unique scenarios. DTK Hydronet Solutions used Bentley’s WaterGEMS to perform the design engineering on this INR 12.38 billion project to improve the lives of more than 1 million inhabitants in the region. Projects of similar scope had required four months of effort to create the initial hydraulic model. Using WaterGEMS, DTK Hydronet Solutions’ engineers accomplished this new model in one month, saving 75 percent in project resource-hour costs. 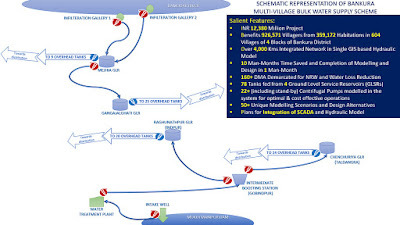 WaterGEMS’ sophisticated modeling capabilities enabled the team to model the existing network and develop proposed roadmaps for the new network in a single GIS model, including assessing more than 39,000 junctions within the network. Village population and density projections were included to help future-proof the design. 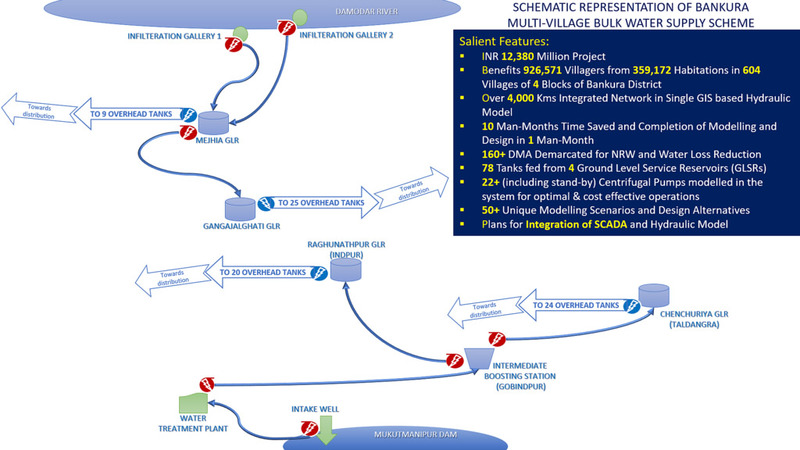 This solution enabled the team to create its initial model of the entire network (existing and proposed new) in just five days. Difficult topography assessments, changes in transmission routes, optimal scheduling of pumping operations and energy-to-cost calculations were all performed on the model as it was revised to yield the final proposed design. In only 25 days, not only was the initial design created, optimized, and finalized, but multiple worst-case scenarios, high-demand analysis, and other “what-if” scenarios were assessed that could not have been performed outside of the single hydraulic model in WaterGEMS.